After hours and hours of debate - mainly from eurosceptics because most of the anti-referendum traitors didn't have the balls to turn up and face the rebels - MPs have predictably voted against allowing us proles a referendum on membership of the EU. A number of MPs gave spirited speeches about how having a referendum membership of the EU would damage the economy, cost jobs and lead to the unnecessary deaths of several kittens. * They were mostly booed or laughed at until the House of Commons filled up towards the end when the Tory traitors filed in and started bleating like the sheep in Animal Farm to drown them out. Adam Holloway MP resigned as Parliamentary Secretary to David Lidington, the EU Minister, during the debate in protest at the three line whip. The pro-referendum MPs on all sides won the moral debate, if not the actual vote. In the end, 111 MPs voted for the referendum and 483 traitors voted against it. Whether any of them do the honourable thing and resign from their party remains to be seen but I would urge anyone who has one of the LibLabCon rebels as their MP to contact them and ask them why they are propping up Cameron's pro-EU dictatorship. If you have been betrayed by your MP and/or party, now is the time to kick them in the ballot box. The EU is unreformable, so are the Tories. Cameron is a europhile and won't give us the referendum we want, the "reform from within" and "repatriation of powers" rhetoric is nothing but lies. There is no way of taking powers back off the EU, it's a one-way street. We have been treated like idiots, betrayed by those who are supposed to represent us. 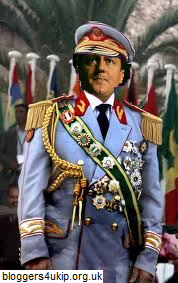 All three of the LibLabCon leaders have behaved like petty dictators and none more so than Cameron. It's time to stop propping up the insulting, antidemocratic LibLabCon dictatorship and the best way to do that is to join UKIP, the real alternative.